This year, Andrew and Aidan had the opportunity to attend the 2018 Zoo Camp at Dade City’s Wild Things in Dade City, Florida. This special event for kids happens every summer and is comprised of three full days filled with amazing, one-in-a-lifetime animal encounters along with fun games and learning opportunities for kids of all ages. Since Aidan is not of school age yet, I got to hang out and make sure he was on his best behavior and I had such a great time watching the boys’ faces light up with each new experience! We missed the first day of Zoo Camp since Avalynn was not feeling well, but the following two days were filled with SO MUCH fun and I’m so thankful the boys got to participate! I’m absolutely sure they will never forget this experience! Ready for some fun? Let me share some of our adventure…. Day 2: Let the Adventure Begin! We started the morning with a nice walk along the property, and then the boys were able to enjoy their first animal encounter…..with a SKUNK! Although the skunk was de-glanded, Andrew was a bit apprehensive, but Aidan jumped at the opportunity to hold the skunk. He has such a huge heart for all animals and is so brave! Then, they got to learn about an anteater up close and personal! 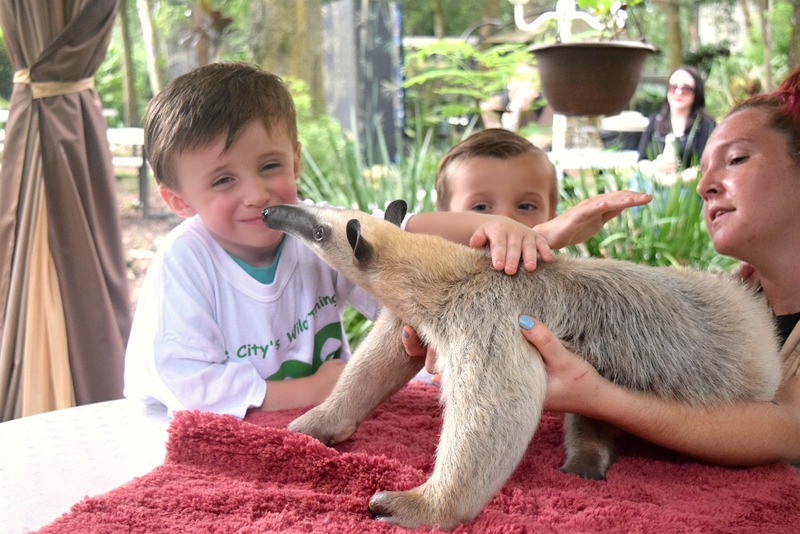 Both boys loved the anteater so much and learned a lot! For example, did you know that anteaters don’t have any teeth?! As we headed back to the pavilion, it began to rain. The kids had a lot of energy and were able to play with some cool, giant frisbees while waiting for the rain to stop. Kids have SO MUCH energy. They jumped and ran around so much that our boys’ cheeks got all rosy–which means they were totally in their element! Andrew and Aidan were the youngest kids at Zoo Camp and seeing them in their oversized shirts reminded me of when I was a kid! It was one of those moments when you see your kids as so big, yet still so little at the same time. It was wonderful to get to watch them experience everything and make special memories together! After working up a sweat, the kids had a break for lunch and drinks. Following lunch, there were more fun activities! The kids got to create some unique art–painted paw prints–with a BABY TIGER! Harley was soooooo cute and super playful! Tigers are definitely my favorite animal and seeing my kids get to meet one up close was pure magic! I mean LOOK at that cute face!!! Once Harley, the baby tiger, was finished making special artwork with the kids, he got to go for a swim in the pool. For those of you in the area, you can actually book a special animal encounter or even swim with Harley! Next up was another fun art project with the CUTEST little Otter. I’ve always loved otters but have never seen one up close before. Usually they are swimming. Just like in the water, they are super active out of the water as well, constantly moving around and exploring their environment. The kids got to spread out some poster papers on the table and watch the otter walk around and make paw prints for them. He was super friendly and got really close to the kids which was so fun! Then, the Zoo Camp kids got to meet an alligator! This was Andrew’s favorite since he’s REALLY into reptiles right now! All of the kids got to hold the alligator and then they sat around the table to learn all about him and see a demonstration of their second eyelids! The entire Zoo Camp experience was really neat because as the kids got to learn about a variety of animals, they were also able to meet them up close and see how they are, bringing everything they learned to life! The kids were also provided with a notepad to take zookeeper notes about the animals (or draw pictures) and some printouts with more information about what they learned, a passport booklet to mark all of their encounters, and some visual checklists to keep track of everything. It was such a fun learning experience for them to see, touch, write, and listen as they learned. Out of all the fun animals the kids got to meet, this was the only one I’ve actually met before! When I was pregnant with Aidan, Drew and I went to a trade show in Orlando and one of the booths had alligator encounters! It’s really interesting how soft they feel on their belly. The boys really enjoyed holding him! Along with some other guests, the kids enjoyed seeing lots of other fun animals up close. I was surprised just how close you get to some of the animals and really enjoyed seeing the property! The safari tour stopped for a bit so everyone could see the adult tigers and one of the guests on the tour had booked a big cat feeding encounter so we all got to watch! It was pretty awesome to see someone feeding a full-sized, adult tiger right in front of us (with a long pole for safety). The tigers were VERY playful, I mean, they are giant cats. They were pouncing and prancing around. One of the coolest parts of seeing them up close was watching how they interacted with Megan (I’m not sure her official title, but she was an animal trainer/handler who had been with the tigers since they were little). It was clear that they had a very special relationship with her and it was really neat to see that in person! In fact, all of the animals had a special relationship with her! Ummm….and in case you’re wondering, I would definitely jump at the chance to be BFFs with some tigers! At the end of the tour, we stopped again for a Buffalo feeding. This time the kids got to each take turns feeding the buffalo a carrot. They had a great time! This concluded Day 2 of Zoo Camp! I was completely blown away by the amount of activities and experiences packed into one day! Talk about making memories that will last a lifetime! I’m so thankful that Andrew and Aidan got to participate in this special event and enjoyed watching them with the animals SOOO much! It was fun to see the animals up close and, most importantly, how happy the animals are. They all look very healthy and happy and it was obvious that the team at Dade City’s Wild Things takes good care of them since they get so excited to see them! I’ve always loved animals and my kids do as well, especially Aidan! This was really so amazing! In fact, we’ve decided that this will become part of our summer tradition for as long as it’s around! If you enjoyed learning about our Zoo Camp adventures, you’re going to want to check back here very soon to see what we did on Day 3– it was just as impressive and the boys got to meet even more cute animals! Which of these animals would YOU most want to meet?